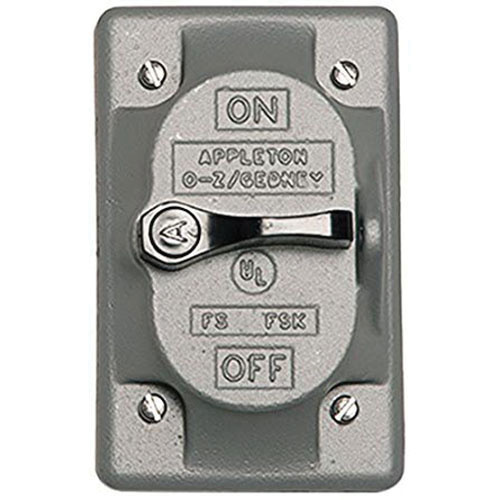 Appleton OZ Gedney 1-Gang weatherproof toggle switch cover is ideal for covering and sealing FS and FD style boxes and to mount wiring devices. This switch cover can mount on ordinary boxes and has standard device box openings. The cover with a single toggle switch, features a lever operator and can be vertically positioned. This lockable cover has sand-cast aluminum construction for added durability and corrosion resistance. The switch cover meets UL 514A, CSA C22.2 No.18, Federal Specification: A-A-50563 and NEMA: FB-1 standards.